Figure A60. Mesopotamia anomaly, interpreted as the Mesopotamia slab, with (horizontal) [vertical] cross sections through (A)[D] the UUP07 p-wave) and (B)[D] the combined SL2013 and S40RTS s-wave models at 1610 km; C) the location of the modern geological record that we interpret to have formed during the subduction of the slab. 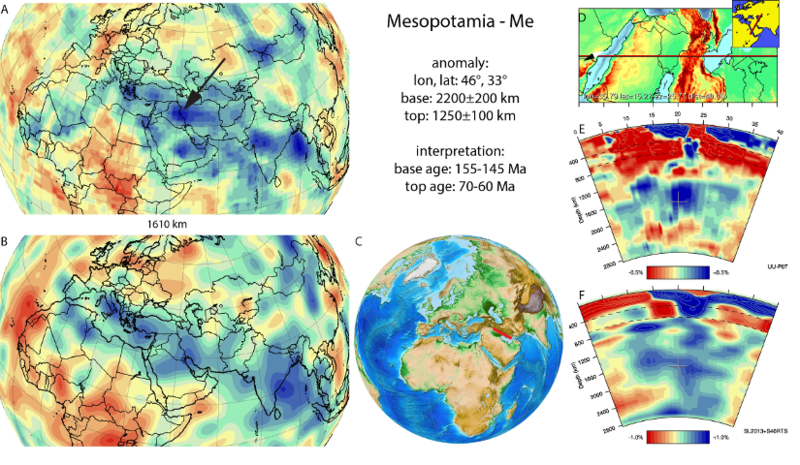 The Mesopotamia anomaly (Figure A60) is located below the Zagros mountain belt at the Arabia-Eurasia plate boundary from the deep mantle up to mid-mantle and connects upward to anomaly residing in the upper mantle. In previous studies it has been referred to as the western part of the II anomaly Van der Voo et al. (1999b), as the SI and AI anomalies Hafkenscheid et al. (2006), or as the Sb1 anomaly in Agard et al. (2011). In van der Meer et al. (2010), we interpreted this anomaly as a slab resulting from intra-oceanic subduction within the Neotethys culminating in the obduction of e.g. the Semail ophiolite of Oman. Closer inspection of the tomographic images below Arabia shows, however, that the Mesopotamia slab at depths of 1100-1300 km is separated from a second slab to the SW (now named Arabia slab following Hafkenscheid et al. (2006)) that is a better candidate to result from subduction below the ophiolites of Oman and Iran. The Mesopotamia slab more likely relates to subduction below the Eurasian margin of Iran (Agard et al., 2011). The oldest geological evidence for subduction below the Iranian continental fragments, which collided with Eurasia in the Triassic (Muttoni et al., 2009) is the Sanandaj-Sirjan magmatic arc, active since ~150 Ma (Agard et al., 2011), providing a probable age for the base of the Mesopotamia slab. Towards the top, the slab appears to be disconnected from the upper mantle portions of slabs (see Zagros slab, section 94). Agard et al. (2011) suggested, based on the age of rapid exhumation of HP-LT metamorphic rocks in the Zagros Mountains that there may have been a phase of slab break-off in the latest Cretaceous to Paleogene, ~65±5 Ma which we adopt as the age of the top of the Mesopotamia slab. A comment on the interpretation of the top age of the Mesopotamia slab and thus also the base age of the Zagros slab. These ages are currently interpreted as relating to latest Cretaceous slab break-off, which is evidenced apparently by rapid exhumation of HP-LT rocks in the Zagros. This view was recently challenged in Deevsalar et al. 2018 (JGSL 175, 915-933). Their paper explored the cause of Eocene within-plate type magmatism in the far west of Iran which has now been recognised in a few studies quoted in that paper. “Firstly, the onset of voluminous magmatic activity in the Urumieh-Dokhtar Magmatic Arc and further east during the Eocene has already been ascribed to rollback-induced slab steepening (e.g. Verdel et al. 2007; 2011; Mouthereau et al. This comment is therefore to state that it seems difficult to reconcile a slab break-off event around 65 Ma ago with the available data because it is not the only possible explanation for exhumation and because the age of relevant break-off-related magmatic activity does not fit. I feel that ascribing a top age to the Mesopotamia slab of early Eocene (~45-40 Ma) may fit a wider range of data. The knock-on implication is that the short burst of early Eocene within-plate magmatism is Eastern Iran, which is followed by the resumption of ‘normal’ subduction related magmatism of the Urumieh Dokhtar Magmatic Arc, marks the onset of what would be a very short-lived period of Zagros slab subduction, between the early-mid Eocene and the Oligocene collision of Arabia and Eurasia.